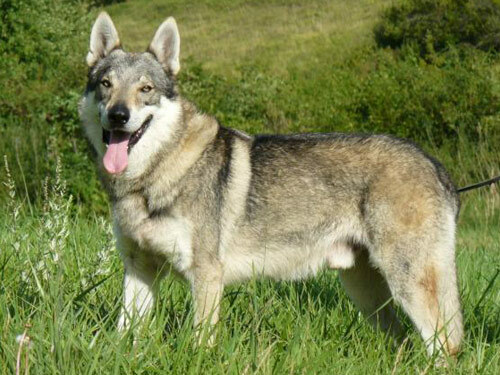 A relatively new breed, the Czechoslovakian Wolfdog was developed by the crossing of a German Shepherd Dog with a Carpathian Wolf. Originally used for military duty, this breed is now used as a reliable guard and defense dog. Czechoslovakian Wolfdog's are considered to be quite rare. The Czechoslovakian Wolfdog's appearance is that of a wolf. The Czechoslovakian Wolfdog is powerful, agile, and built for speed. They exhibit grace, ferocity, and are absolutely fearless and courageous. The Czechoslovakian Wolfdog is not recommended for first time dowg owners, homes with children, or homes with other pets. They are highly protective of their home and territory. The Czechoslovakian Wolfdog breed is independent, active, and lively. They typically form a close attachment and are tremendously devoted to their owner. Special attention should be given to the coat during heavy-shedding. Bathing is rarely required as the coat is relatively self-cleaning. Due to the rarity of this breed there are no known health issues. The Czechoslovakian Wolfdog breed does best in colder climates. The Czechoslovakian Wolfdog breed has a double coat that blends into a thick, straight, close lying coat. This breed sheds heavily twice a year. Intense ongoing socialization and obedience training is an absolute must. The Czechoslovakian Wolfdog requires short and varied sessions to prevent boredom. It is imperative that training be done with respect, firmness, fairness, patience, and consistency. The Czechoslovakian Wolfdog breed is not recommended for apartment or city living. The Czechoslovakian Wolfdog requires a lot of exercise and does best in a rural setting with room to roam and a family property to guard.